Hello friends. Forgive my absence yesterday, we had a last minute appointment in Edmonton. Today, I enjoyed the peace and quiet of being home alone. The weather is miserable, so it was a great day for introverting and scrapbooking. 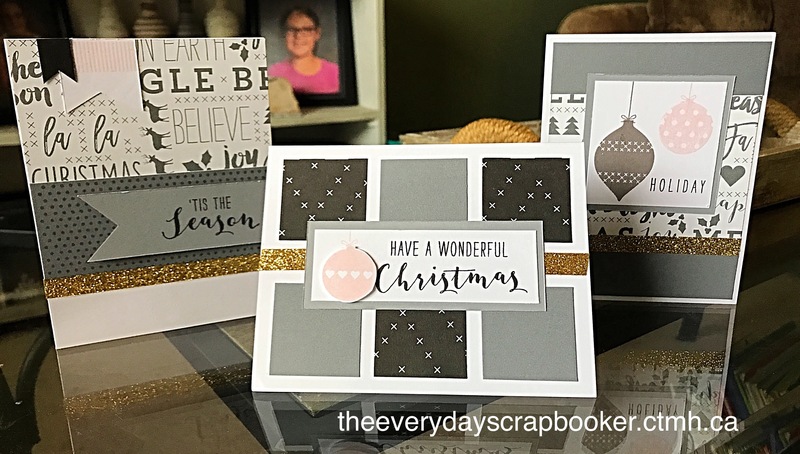 I prepped for my Fall Card workshop, which is Friday, and then I created card samples for my upcoming Christmas workshop. Once that was done, I dove into starting my Christmas cards! Here, I’d love to show you what we’re making. I absolutely love them! I followed the CTMH Creative Insider cutting guide to create the middle card and the card to the right. But, instead of strictly using the Pewter ink, I swapped it out for Bashful. I also based the card on the left on a card found within the Silver & Gold Workshop Your Way kit. It’s a bonus project, but loved it! That card was also tweaked just a teensy bit from the original. I just ADORE Bashful paired with the gold shimmer trim and all new Pewter ink. It adds a touch of femininity and softness. And, I love the non-traditional Christmas colour scheme. Those patterns? Divine! This workshop is taking place November 18, 2017. If you’re interested in attending, please rsvp by November 3, 2017. If you love these cards but live too far away to attend my workshop, I have good news! As an alternative, I’ll create a cutting guide so you have the freedom to create at your own speed, in your own home. It’s yours FREE if you place an order with me (only for residents within the borders of Canada 🇨🇦). If that’s you, please contact me. I’d love to help you get creative! *Just a note, my cutting guide will be based on the cutting guides I used to create my samples, but it’ll reflect the changes I made to them for my own workshop. Thank you! Both inks and the paper is new to CTMH so it was a real treat to play with them!